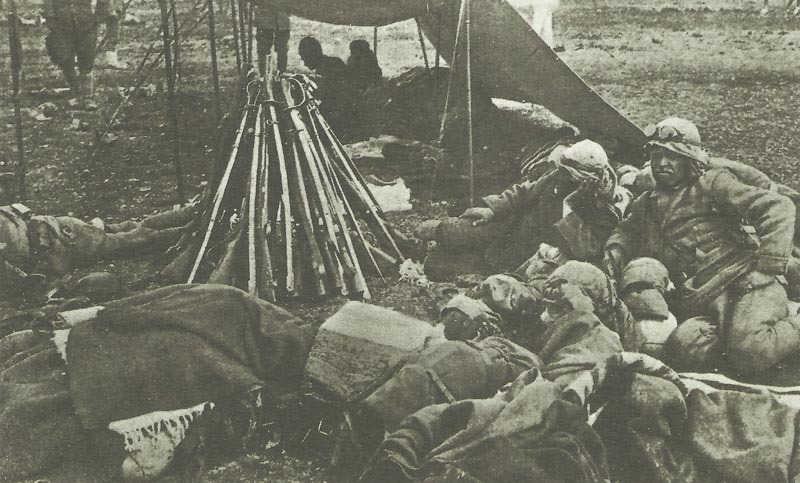 Turkish cavalrymen operating against the Russians in the Caucasus at a field camp. Armenia – Battle of Sarikamish ends: Turkish IX Corps destroyed; 1,200 PoWs including Ihsan Pasha, 30 guns and 20 MGs. Flanders: French advance near Nieuport. Alsace: Whole of Steinbach now in French hands. Adriatic: Austrian Admiral Haus proposes using new Light cruiser Novara (completed on January 10) to run 300t munitions to Smyrna (for Dardanelles), but scheme abortive (until April 12). North Sea­: British submarines C31 and E10 lost (on January 4 resp. 18, causes unknown). Black Sea: Russian cruiser Pamiat Merkurya damages Turk cruiser Hamidieh west of Sinope. Italy: Austrian Rome military attaché reports Italian Army will be ready for war end March. Britain: Fisher withdraws resignation over Zeppelin threat.